Square Victoria began its vocation as a Victorian garden in 1860 and became an icon of Empire when the statue of Queen Victoria was inaugurated in 1872. Its current role is that of a city park linked to those international and banking institutions that occupy the buildings around it. Yet, the name of the square that is reminiscent of a monarch that ruled when Britain was a colonial world power has been retained. The Hector Guimard Metropolitan sign made in 1900 for the Paris Metro and installed at the Saint-Antoine stairway of the Metro in 2003 links the square to France. The Tai Chi sculpture by the Taiwanese Ju Ming installed in the square in 2006 heralds the entry into world commerce of Asia as a major player. In its present role, Square Victoria occupies a public place that has become an icon of globalizaton. 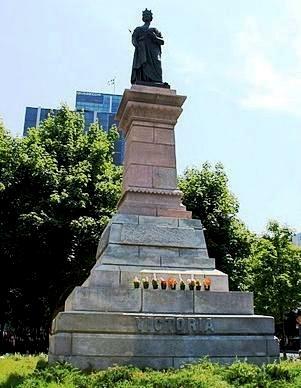 The square was the object of an artistic intervention on 16 June 2011 when nine begonia potted plants were placed on the pedestal of the statue of Queen Victoria. The begonia was chosen because it has come to lead a double life: As an indigenous plant that survived over the millennium and self-propagated on its own into different species as nature intended, and as the result of various hybrids created by genetic manipulation since colonial Europeans discovered it. Within the context of Square Victoria’s history and location the begonia was the appropriate medium for the intervention because its twin history can be used to show the dual role of Square Victoria: As a city park and as a representation of global capitalism. The purpose of the intervention was two-fold: As a reminder of how colonization pushed aboriginal populations off their land to take their natural resources, and to give awareness that global institutions are financing the exploitation of natural resources regardless of the ecological consequences.